People who won't fight Saddam are commies; avoid them and their position on the war. The author wants the viewer to believe that opponents of a war against Iraq are probably communists and traitors. S/he also wants them to do the patriotic and moral thing - support a war against this evil man. The text asserts (but provides no evidence) that the "LEFT" opposes the war, and that all war opponents are leftists. 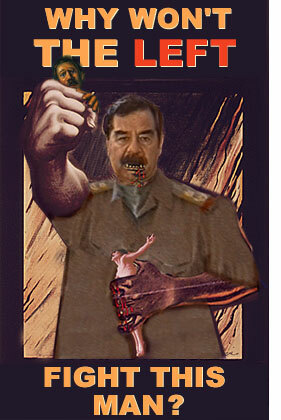 It further implies that "leftists" support Saddam, and therefore are as evil as he is depicted. To reinforce this point, the artist has painted the word LEFT in red. This subtly identifies war opponents as communists (commonly called Reds in the US) in many people's minds. This message was reinforced (and thereby gained validity) by constant repetition on television, in newspapers and magazines, and in political speech. When the US finally attacked Iraq, contrary messages (always fewer anyway) virtually disappeared from American media life. By default many people, uncritically, came to accept it as true. copyright © 2003-2004 classroomtools.com. All Rights Reserved.